​Will SUP Wheels ® work with my board? YES, SUP Wheels ® will carry any board that tapers down to 15 inches (38cm) wide. This 98% of all the boards on the market. The whole tail does not need to fit into the frame. SUP Wheels ® will carry race SUP boards, standard SUP boards, along with other fin boards like windsurf boards and some kayaks. You only need this one carrier to transport just about any type of personal water sport device. If you don't think your board will fit ​contact us we can make adjustments to fit your board. What is the difference between the Classic and the Evolution models? The Classic SUP Wheels ® is the cart which is the frame and the wheels. You hold the end of the board with your hand to pull or push the board to move it. Additionally the Classic can carry two boards with a cam strap lashing the two boards together. Cam strap is not included but can be purchase at your local surf/sup shop or hardware store. The Evolution is the Classic but with the added strap handle. The strap handle connects with webbing strap under the board from the axel to the front the nose of the board. The nose lies in an adjustable mesh hammock with a comfortable handle. You hold the handle to pull the board to move it. The Evolution with the strap handle is designed to hold one board. However, you can remove the strap handle to make it a Classic and carry two boards with a cam strap. Which model connects to the bike and how? The Evolution is the model to walk or bike your board to the water. Take the handle and twist it to create a loop. Take that loop and put just the front of the bike seat and allow the strap part of the handle to criss-cross over the bike seat. Keep the nose of the board close to the front edge of the mesh hammock (close to the handle) this keeps the board away from the wheels. Readjust as needed on your return trip from the water. Your wheels now have wheels. How do I install the SUP Wheels ® sup cart on my board? Lay the board upside down with the fin sticking up. Then pull the arch up so the sides fit snuggly against the side of the board. Install the adjustable bungee cord to the hooks on the frame to the estimated desired length. Then lift the bungee cord over the fin without dragging the cord along the edge of the fin. If needed remove and re-adjust the bungee cord. Once board and the bungee cord are firmly in place you will not need to re-adjust the bungee cord if you are using the same board each time. ​ How do I connect the Strap Handle to the axle and the board? How do I connect the SUP Wheels Evolution to the bike? How to stop the board from touching the back wheel of the bike? 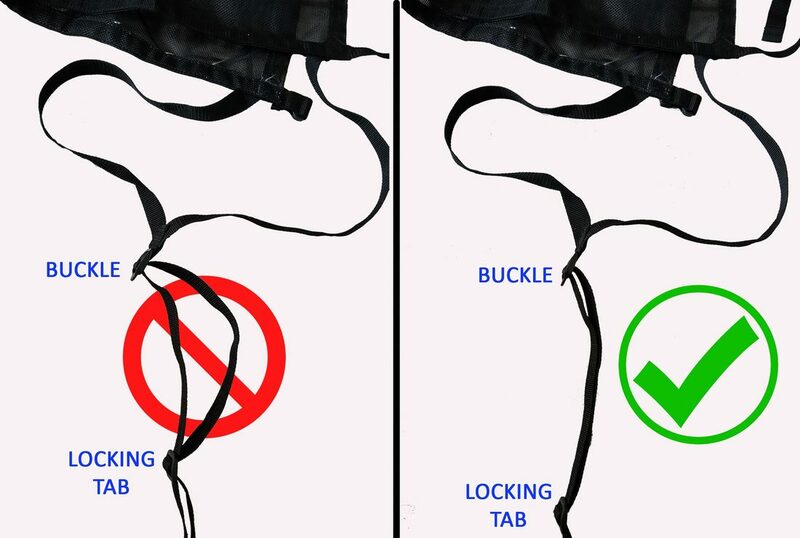 ​Extra hold can be achieved by wrapping the extra webbing around the lock tab and tying a knot. This is good for extra long bike rides. If the unit is not pulled tight into the frame by the webbing this may cause your SUP Wheels not to stay straight and wheels touch your board. Will SUP Wheels ® work on the beach (on sand)? YES, SUP Wheels ® will roll on the beach and on the sand. See videos on the video page. 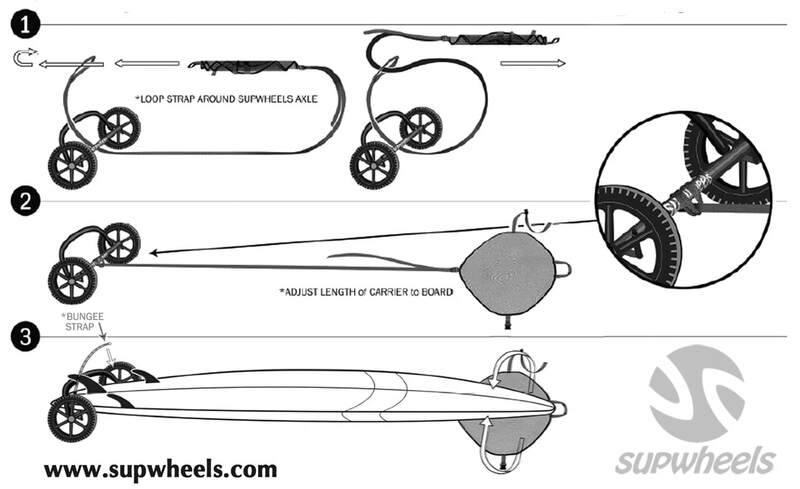 Will SUP Wheels ® work with inflatable SUP boards? YES, SUP Wheels ® will work with most inflatables boards that have a tapered tail. Will SUP Wheels ® work with a roto-molded boards (plastic that is also used to make kayaks)? At this time we do not have a model to work with these crossover kayak type paddle boards. Can I ship SUP Wheels ® to another address other than my credit card billing address? Can I purchase SUP Wheels ® without using a PayPal account? YES, look for the link credit card option on the shopping cart. Don’t I need fat blow-up tires to work on the beach or sand? We have eliminated the drawbacks to pneumatic (air or tube) tire wheels. Pneumatic tires require air to be pumped back into the tire up every time you use them. By utilizing the largest wheels in the industry, the 14 inches (35.5 cm) solid rubber tire wheel will roll over sand and over just about any rough terrain. When you get a flat with a pneumatic tire it is going to be when you are trying to transport your board back home from the water. Now you have to carry your board and your wheel system. Will I need to assemble SUP Wheels ® or need tools? No assembly required and no tools required. Will SUP Wheels ® roll over a standard curb or rocks? The advantage of the 14 inch (35.5 cm) wheels is that they will roll up or down over a standard curb and other obstacles. Other carriers with small blow up wheels can’t go up over a curb without you picking up the whole board with the wheels still attached. If you wanted to do that much work you wouldn’t use a SUP carrier. Do I need a suction cup handle like I have seen on other systems? The Evolution model has a handle built into the system. We don’t recommend you put a suction cup handle on your board due to delimitation issues.